The Link Between Climbing And Business Leadership Everest 2013: What is the Easiest Route on Everest? Whenever someone tells Nelson they have trouble remembering names, he nods, smiles gently and tells them he once had that problem but recently memorized a deck of cards in 30 seconds. Oh, and so can you! Who is this mental giant? Truth be told, he is just a normal guy living in Florida who has taken on the world of memory for all the right reasons. And his favorite food is the Goji Berry, well actually its pizza for this 29 year-old. Nelson went on reach the Hillary Step but stopped short of the summit. More on that in a moment. We also share something else – Alzheimer’s in our family. Nelson lost his grandmother to the disease in 2009. It changed his life. He set out to better understand how our brain works, specifically memories and found that anyone can improve their memory skills. Now he is a champion in memory contests winning the 2011 and 2012 USA Memory Championship – an Olympiad for ‘thinking’ games. The competition is set up as a sporting event for Mental Athletes, with memory challenging tournament-style competitive events including memorization of: 117 names and faces, a shuffled deck of cards, an unpublished poem, speed numbers, and a list of 500 words. Born in London, his family moved to Florida when he was eleven. Now he is off to Everest, climbing the north side with Phil Crampton’s Altitude Junkies team. Please meet Nelson Dellis. Q: I want to start with Alzheimer’s and your Climb for Memory non-profit. Please tell us about your grandmother and how her Alzheimer’s changed you. My grandmother was the sweetest lady ever, but she passed away in 2009 due to complications related to Alzheimer’s Disease. After she passed, I was inspired to learn more about the memory and to see if there was anything I could do for my own brain so that maybe I wouldn’t suffer the same fate. One of the first things I discovered was the USA Memory Championship, a competition where people come together to memorize massive amounts of pointless information in a very short time. What impressed me the most about the competition was the fact that everyone who competed did not have a naturally good memory. Rather, they all had learned some memory techniques and simply trained their mind to do these incredible feats of memory (like memorize a deck of cards, 100s of digits, etc). As soon as I tried the techniques and saw that they worked, I was hooked. I kept training and training, always learning more about how my memory works and how to make it stronger and healthier. It’s now almost 4 years since then, and I feel like my brain is incredibly strong. Along the way, I decided to start a non-profit called Climb For Memory. I wanted to do 2 things: 1. raise awareness for Alzheimer’s Disease by doing something interesting and 2. find a way to spread my knowledge of brain health to as many people as possible. Climb For Memory made sense because I love climbing and thought that bringing the cause to some of the most beautiful and highest places in the world, might be a great way to gain some attention. You can learn more about my charity here where I also blog frequently about a lot of things memory related. Q: As the winner of several US Memory Championships, you are quite the celebrity on TV these days (CNN, Today Show, Dr. Oz, etc.). What is your message? My main message for people is that you shouldn’t just be satisfied with being physically fit – being mentally fit is equally important. I want people to know that mental health is something that can be achieved with some daily mental exercise, healthy diet, and physical exercise. Q: Everest. In 2011 you reached the Hillary Step and turned back. That was so close. What happened? ARGH! SO close. 280 vertical feet close, actually. I felt so strong that whole 2 month expedition. 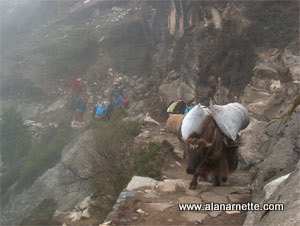 Even as we left for the summit at 8pm on May 12th, 2011, I felt unstoppable. When we reached The Balcony in just under 4 hours, I was feeling fantastic. But when we took a rest, drank some water, changed my bottled oxygen, and then put my oxygen mask back on to continue climbing, I realized that it had frozen and I couldn’t breathe properly through it (I was getting the supplemental oxygen, but no outside air). I panicked. I eventually figured out a way to breathe by creating an opening at the bottom of the mask, but it was pretty much me just breathing entirely the outside air and hardly any supplemental oxygen. Anyways, I climbed up to the South Summit with this issue and felt myself rapidly becoming insanely tired. And then suddenly I hit a wall. By the time I was about to go up the Hillary Step, I felt like I had nothing more to give, especially considering that I still had to save some energy for the descent. I remember being very “out of it” at that point, so I knew I had to make the decision to turn around quickly. So I did….it was seriously one of the hardest things I’ve ever had to do. I was so disappointed in myself. It’s tough to say what the real reason was for me turning around – I always say it was because of the frozen mask, but it may have been a few things that all came together at the same time: me actually having been physically tired, me mentally giving up, the freezing cold and the strong winds, the fact that I was scared – who knows? Q: I know you train your memory and recently memorized a deck of cards in 30 seconds but how do you train your body for Everest? 29.84 seconds to be exact! My physical training this year has been all about Crossfit. I tried it out last February because my friend kept bugging me about it and I haven’t looked back. I have NEVER felt this strong. My endurance, my strength, my cardio, has all increased tremendously. I work out 6 days a week roughly. Well I do 3 days on, 1 day off (active rest), then repeat. Some weeks I’ve tried going without a rest day for as long as I can to work on recovery. I know it sounds like overkill, but it’s working for me. I’ve put on about 20 lbs of muscle since last year. Obviously I’m going to lose it all on the climb, but I’ll have a good buffer. Plus, I’m going into fatso mode come March to hopefully put on a few good pounds of fat 🙂 Ahhh….the pre-Everest diet: EAT ANYTHING AND EVERYTHING YOU WANT!! Q: Do you think your memory skills will help on Everest and did you see any affect from the altitude when you were at 23,000 in 2011? Interestingly enough, in 2011 I did my memory training up the mountain to see how good or bad my scores would become. The weird thing: my scores got better. I guess the techniques I use are way more powerful than the fact that less oxygen was getting to my brain. At the time, I memorized a deck of cards in my fastest time ever up at Camp 2. One of the things I always tell people is that when I was out-of-it, sitting at the South Summit, trying to figure out whether I was going to turn around or not, I truly feel that because my memory was so vivid (thinking about memories of my family and home) and so well trained, that it helped bring me back to life, helping me make the decision to go back down and stay safe. So yes, I definitely think my trained memory helped me out on Everest. If anything, it’s helped me learn how to focus and push myself more – and as many mountaineers know, mountaineering is pretty much a mental game. Q: You are climbing from the North this year. Why did you switch from the South? Good question. Well, I had initially planned to do the South again because I figured, if I’ve climbed 98% of the route then that’ll be to my advantage the next time around; I’ll know exactly what to expect. But as November and December of this past year rolled around, I started almost dreading the fact that I was leaving for Everest soon. That didn’t feel right. If I’m gonna climb Everest, then I want to climb while being excited and super pumped for it, not afraid. It wasn’t that I was really afraid, I was just not ready to go back and re-live certain hairy and uncomfortable parts of the mountain. I love the Khumbu and the BC lifestyle over there, but I think knowing too much of what was to come was actually starting to become a disadvantage. So I made the decision to swap routes. I’ve always wanted to see Tibet and to climb beside the amazing North Face. As I made the decision to switch, I started to feel that excited, butterflies-in-my-stomach feeling that I knew I should be having before a climb. I think there will always be a sense of regret that I never finished the South side, but hey, what are climbs really about? The one point at the summit, or the whole journey? Q: Will you be doing any memory demonstrations from the summit? Yes! I’ll be doing the same thing I did back in 2011, training and keeping track of my scores with the elevation changes. I’ll also be attempting to memorize a deck of cards at the highest camp in the world, Camp 3 at 8300m. Q: Who will you be climbing with? Reliable expedition outfitters on the north side are few and far between, but having talked a good deal with Phil Crampton, I’ve decided on Altitude Junkies. You’re the one who provides all the good info on Everest, so I should ask you that! But seriously, it should be an interesting season. I’ve heard it might be quieter than last year? Also, I’ll be blogging and updating live from camp this year on Facebook and website . Best of luck Nelson, I know you will reach the summit this year and create ever more enduring memories. You can follow Nelson on Facebook and his website . Good luck Nelson on your climb this year, we will be following you to the top and back down! All the best to Nelson Charles Dellis! Go and represent Miami FL!